Authoring Kit (HAK) for adding additional game rules to Herolab. I will not use the term review, since I did not actually enter an entire game system using the HAK. Think of this as a quick overview from someone that read the manual and reviewed the sample files. The HAK is a free download for Herolab that comes with the partially-completed “Savage Worlds” rule set as an example. Both are still in an “almost finished” state, but usable. Here is the start-up screen after installation. The HAK has two components; sample data files and an online wiki explaining how to edit the files. To get started, you copy the sample data files to a new directory and use that as a starting point for your home built rules set. That is how I created the “Trask” entry on right. This directory contains the images and configuration files for your new game system. The idea is to edit the various XML files in your directory and add the rules, equipment or stats for your new system. 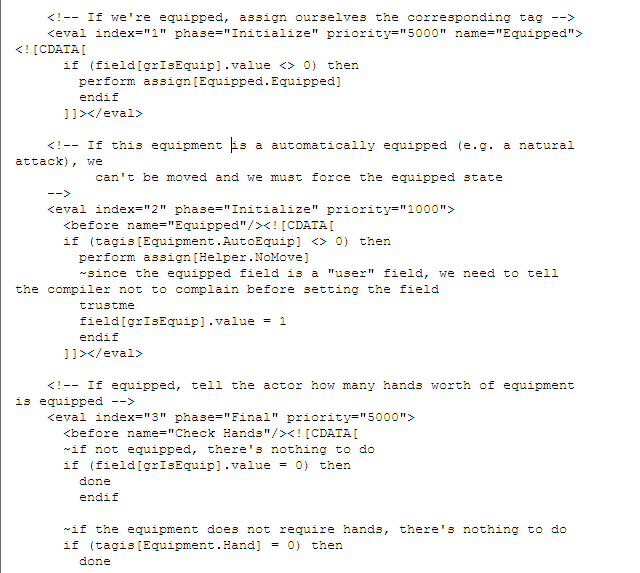 I grabbed a sample of the “gear” file and posted it below so you can see what the configuration files look like. I give Herolab credit for some great code annotation. There are copious comments throughout the files and they are easy to follow from a programming standpoint. After looking at the XML, I moved on to the HAK wiki. The HAK wiki is about 75% complete, with some final sections missing. There is enough information to get you started on the key elements of your new system. The wiki is surprisingly well written and chock full of useful examples. 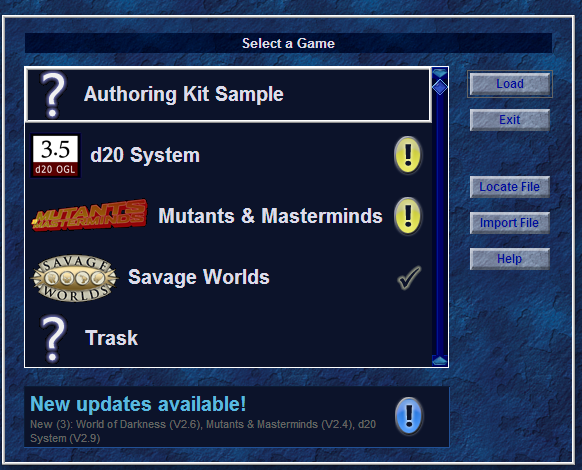 The wiki, in combination with the “Savage World” system examples included in the HAK provide enough information to create your own game system in Herolab. As to complexity, I am a system administrator for XML-based applications, so I found the HAK easy to follow. Someone with less computer knowledge may find it more difficult. There is, of course, a “catch.” Entering an entire system from scratch ( ie 4E D&D) entails a tremendous amount of data entry initially and ongoing work in the long-term. Updates for new products, bug fixes or other tweaks require an ongoing effort. Simply put the HAK is not for a single user, but a group project. Anyone considering using the HAK should look towards the Linux community for ideas about large-scale project management and volunteer contributions. Additionally, while the HAK is not hard-core computer programming, a strong XML background is suggested (by me anyway). Reservations aside, I am thrilled that Herolab released the authoring kit. They made it possible for the Herolab community to contribute and improve the product. Considering Linux’s success with a similar development model, I am very optimistic about the long-term success and utility of the Herolab package. So, what is that embedded in the XML? Is that VB script? I suppose that would make some sense.